Dupont Italian Kitchen offers both indoor and outdoor seating, a menu of Italian cuisine and a full bar. The food here is plentiful but not anything to write home about. The main benefit is the expansive outdoor patio on 17th Street sidewalk. On a warm D.C. evening, with patrons sipping Italian wines, this place is the place to be. Near: at R St. N.W. I've never been disappointed here. It won't win any awards for originality, but it's a reliable place to go for chicken parmigiana and people-watching in Dupont. If he weather is good, the patio is a great place to enjoy veal, wine, and some interesting sights on the sidewalk. Dupont Italian Kitchen's location on 17th might just be its best feature. I went on a chilly fall night, so there was no outdoor seating, and inside the place could be nicer--older floor tiles, awkward tables and chairs that could be replaced with nicer ones. The service was fine if a bit disinterested (certainly no hot gay waiters here, the only attractive men were the customers), but the food made up for it: everyone at my table enjoyed their different meals, from pizza to pasta, even if we had a pretty small selection to choose from. I ordered a Cosmo and have to say it was the worst drink I've ever had in a restaurant--hopefully the bar upstairs has better bartenders! 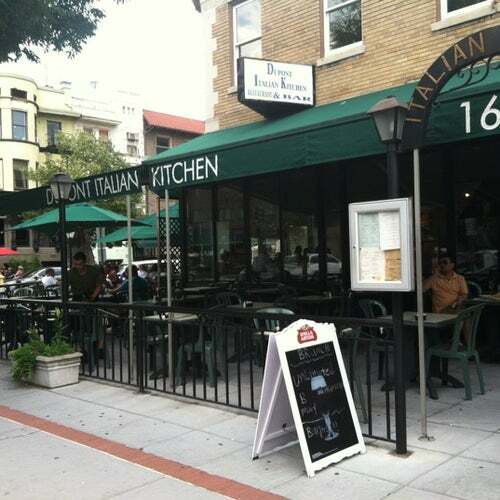 This place is perfectly located on the corner of 17th and R and provides a relaxing environment, tasty Italian cuisine, and a view of all that Dupont Circle has to offer. All first time visitors should make it a point to drop by for lunch, dinner or brunch. The food is authentic, tasty and very moderately priced. Drink specials which vary on the season are a great attraction. After dinner you just need to go to the floor above and enjoy Windows -- a gay bar -- often referred to as DIK -- Enuf said. Very gay-popular restaurant with outdoor seating in warmer weather. Except for a terrific Caesar salad, food is rather average, but the price is right and the service is friendly. On the second floor is DIK bar, a favorite among older locals and tourists, too.